You are allowed to download the software on this page for free and to use it for your own projects, no matter if private or commercial. By using the software you agree, that you use it on your own risk. The author of this software cannot be held liable for any which result from the use of the software. Es ist Ihnen gestattet, die Software von dieser Seite kostenlos herunterzuladen und sie für Ihre eigenen Projekte zu benutzen, egal ob diese Projekte privater oder kommerzieller Natur sind. Durch den Einsatz der Software stimmen Sie zu, daß Sie sie auf eigene Gefahr hin benutzen. Der Author dieser Software kann nicht für Schäden haftbar gemacht werden, die aus der Nutzung dieser Software herrühren. APIinfo EXE APIinfo is a little tool which allows you to convert APIs into various programming languages. Currently, C#, VB.Net and VB6 are supported. Win32 API is included. Additional APIs and programming languages can be added easily as all data files are in XML format. HKS Serializer DLL Includes classes which replace System.Drawing.Color and System.Drawing.Font and allow serializing. System.Drawing.Color HKSSerialization.Drawing.Color HKSSerialization.Drawing.Color provides the same properties and methods as System.Drawing.Color. In addition it allows to directly assign values to its A, R, G and B properties. It also allows to compare two color values. HKSSerialization.Drawing.Color can be implicitly converted to System.Drawing.Color and vice versa. System.Drawing.Font HKSSerialization.Drawing.Font HKSSerialization.Drawing.Font provides the same properties and methods as System.Drawing.Color. In addition it allows to directly assign values to its Bold, FontFamily, GdiCharSet, GdiVerticalFont, Italic, Name, Size, Strikeout, Style, Underline and Unit properties. It also allows to compare two fonts. HKSSerialization.Drawing.Font can be implicitly converted to System.Drawing.Font and vice vers. -- HKSSerialization.Drawing.ColorFont HKSSerialization.Drawing.ColorFont provides BackColor and ForeColor properties. 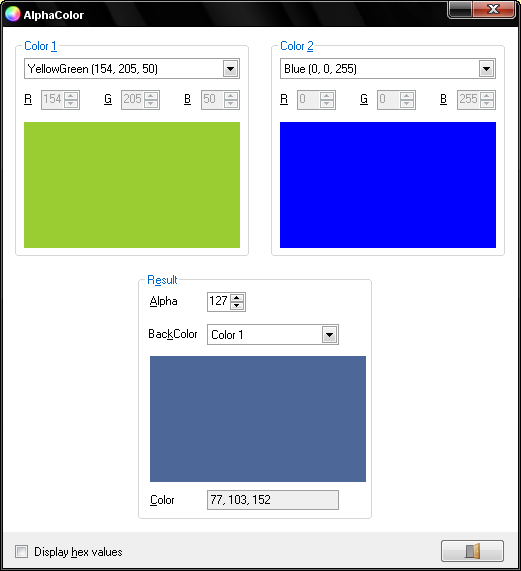 The default BackColor is SystemColors.Window, the default ForeColor is SystemColors.WindowText. HKSSerialization.Drawing.ColorFont can be implicitly converted into HKSSerialization.Drawing.Font or System.Drawing.Font and vice versa. HKSMailer EXE Allows you to send an e-mail to e-mail each recipient in an address list. Try it out! Help files are available in English,German, Chinese (simplified) and Chinese (traditional). PasswordStore 1.0.1 EXE PasswordStore is a tool to keep your passwords safe. It allows you to manage different PasswordStore files with different passwords. Each file is encrypted using the Rijndael algorithm to keep your data safe. Each PasswordStore file allows you to organize an unlimited number of passwords and remarks. To learn more about PasswordStore, you might want to read the user guide. FontToImage 1.0 EXE FontToImage allows to save all characters of in these file formats: BMP, GIF, ICO, JPEG, PNG and TIFF. You can define background color and text color as well as if the character should be put into a larger picture and how it should be aligned. StringToImage 1.0 EXE StringToImage allows to save the specified text in these file formats: BMP, GIF, ICO, JPEG, PNG and TIFF. You can define background color and text color as well as if the text should be put into a larger picture and how it should be aligned. MP3Player Java Eclipse Project MP3Player is a skinnable MP3 player using JavaFX's mediaPlayer class. All sources are included. Feel free to use/modify it.